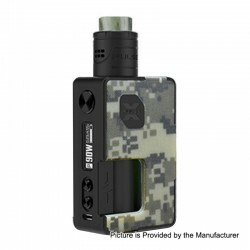 The Original Vandy Vape Pulse X 90W Kit consists of the Pulse X 90W TC VW squonk box mod and Pulse X BF RDA. This item also has other colors to choose. Mod: The Vandy Vape Pulse X Mod has maximum power output of 90 watts with single 18650 / 20700 / 21700 battery (NOT INCLUDED). It is powered by Vandy Chip, which has excellent quality and highest stability. The replaceable panel comes with magnetic structure design. RDA: The Pulse X RDA feeds the juice directly to the top of your coils, giving you the experience you would get with typical dripping atomizers, and saturating your wicks and coils from the top. This ensures that your coils are always wet and ready to go. When squonking, the one-way-valve design allows excess juice to return to the bottole at the bottom. It also allows you to drip right onto the center through the drip tip for non-squonk usage, and the liquid rolls off the top center of the post and onto your coils. The "X" design for the post can be used effectively for vertical and horizontal builds, and can accommodate large or small coils.